Looking to buy a new home? Use the new Municipal Land Transfer Tax (MLTT) and enhanced residential Property Tax calculators to get tax estimates instantly to help plan and budget for your next move. These new calculators are available online and can be used anytime, anywhere. The MLTT calculator provides estimates for first-time home buyers, single family homes and all other properties. The enhanced Property Tax calculator provides a detailed estimate of the property taxes for residential properties and a breakdown of how your tax dollars are working for you. This is part of the City’s commitment to modernizing services and improving customer experience. For more information about Municipal Land Transfer Tax and/or Property Tax, visit toronto.ca/revenueservices. Thank you to everyone who was able to attend the Community Consultation meeting on the Roncesvalles and Dundas Planning Study earlier this week. For those who were unable to attend or who may wish to review the Staff presentation, it is available below. Your input is important to this process, please forward your comments to my office at councillor_perks@toronto.ca and/or Joanna Kimont, City Planner at joanna.kimont@toronto.ca. You are invited to the 2nd Public Open House to discuss the proposed cycling route on Dowling Avenue, between the existing signed cycling route on Sorauren Avenue and the Waterfront Trail. The objective of this route is to provide residents with easier and safer access to the waterfront by bicycle and create a gateway to greenspace for the Parkdale neighbourhood. This proposed cycling route was identified as part of the City’s Cycling Network Plan, which presents a vision for how we may connect Toronto’s cycling routes. The plan was approved in principle by Council on June 9, 2016 with the understanding that each route recommended in the plan would require further consultation to inform design option and to evaluate potential parking and traffic impacts. In response to feedback received at the first public open house in September 2016, and through emails and phone calls, the City is now proposing a revised design for the cycling route. Past notices and materials from the first Drop-In Event public consultation events are available online at: www.toronto.ca/yellow-bicycle-lanes. Potential measures for the Dowling Cycling Route could include bike lanes, traffic calming measures, cycling wayfinding and new or modified traffic signals. On May 14 and 15, 2016, crews demolished the Dowling Avenue Bridge over the Gardiner Expressway and a temporary crossing for bicycles and pedestrians has been installed. The City is presently in conversation with Metrolinx, regarding a study for the design and construction of a permanent structure. Presently, Dowling Avenue between King St. West and Queen St. West carries traffic one-way northbound and so the feasibility of introducing a southbound “contra-flow” bicycle lane is being evaluated. This proposal would allow for lawful two-way cycling travel, however due to the narrow width of this roadway the introduction of a bike lane would require the displacement of approximately 32 on-street parking spaces. Transportation Services is undertaking a parking survey of the area, to measure the overall parking supply availability, and would appreciate your feedback as part of this process. Following the consultation period, staff will use feedback to inform preferred design solutions and report to City council in 2017. The target implementation period of this project is 2017-2018. If more information is required, you can reach my office at councillor_perks@toronto.ca or 416-392-7919. Look forward to seeing you at the open house on Wednesday, May 17th, at Parkdale Public Library. 12 years after its creation, Ontario’s Greenbelt is growing to include urban river valleys across the region. In Toronto, these include the Don, Humber, and Rouge Rivers, and Morningside and Etobicoke Creeks. These green-blue corridors provide critical connections for water and wildlife, and between urban and rural residents. They will become increasingly important places as our region attempts to cope with the impacts of climate change while accommodating an estimated 2.8 million new residents by 2031. Join the Friends of the Greenbelt Foundation as we try to unravel what all this means for Toronto and the Greater Golden Horseshoe region. As part of the electrical upgrades planned at the Roncesvalles Carhouse, the contractor will be using a generator to power the facility in order to maintain regular operation. To minimize noise, a low-noise generator has been secured to provide temporary power for approximately one week while crews install new permanent electrical feeds to the carhouse. During this period, area residents may notice an increase in noise. The generator will be situated the furthest distance possible from residential properties in order to minimize disruption to area residents. The generator selected for this work is commonly used in noise sensitive areas because of its low-decibel operating performance. Given that the carhouse supports 24-hour transit service, the generator will operate continuously starting Sunday, April 23, 2017 until Sunday, April 30, 2017. There will be no impact to streetcar operations. Raw Materials is thrilled to announce the second instalment of ‘SHHHHH’, an annual event consisting of diverse musical programming at the Parkdale Public Library. The performances will be spread over two days, all free and accessible to the general public. May 5th’s sets will take place on the main floor of the library 7pm-8pm, while May 6th’s will happen in the basement auditorium 1pm-5pm / accessible by stairs or elevator. Green Bin exchanges will not be available at Community Environment Days events due to the coming new style of Green Bin. The Preliminary Report will be available April 25th on-line through the 2017 Toronto and East York Community Council (TEYCC) Meeting agenda at http://bit.ly/2oDilH4. The Report will also be available at the meeting. If you are unable to attend the meeting, please forward your comments to Kirk Hatcher, City Planner, Kirk.Hatcher@toronto.ca and/or Councillor Gord Perks, councillor_perks@toronto.ca . 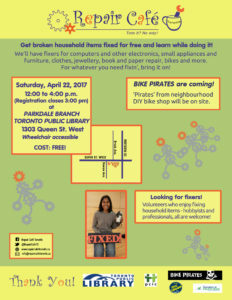 Get broken household items fixed for free and learn while doing it! There will be fixers for computers and other electronics, small appliances, furniture, clothes, jewellery, book and paper repair, bikes, and more! With a special appearance by Bike Pirates!